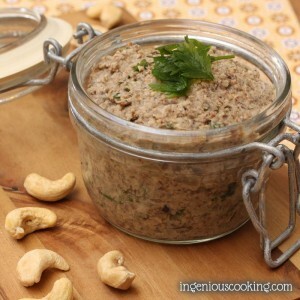 5-ingredient vegan mushroom-cashew pate: creamy and full of flavor. Roast cashews in a dry pan over medium heat until golden brown. You could also do this in the oven: 10 minutes at 180 C / 360 F.
Finely mince onion and add to coconut oil over medium heat. Fry until translucent. Put cashews in food processor and mix until finely ground. Add other ingredients (onions, mushrooms, parsley, salt, pepper) and mix until smooth.